AJ's Deer Valley Real Estate 2016: Vail Resorts Inc. to operate Canyons! Vail Resorts Inc. to operate Canyons! at Canyons Resort, is big news in Park City. In fact, I believe this is the largest headline in the Park Record (June 1 Edition) since the announcement of the Salt Lake Olympics! This could also spell good things for Deer Valley and Park City Real Estate! 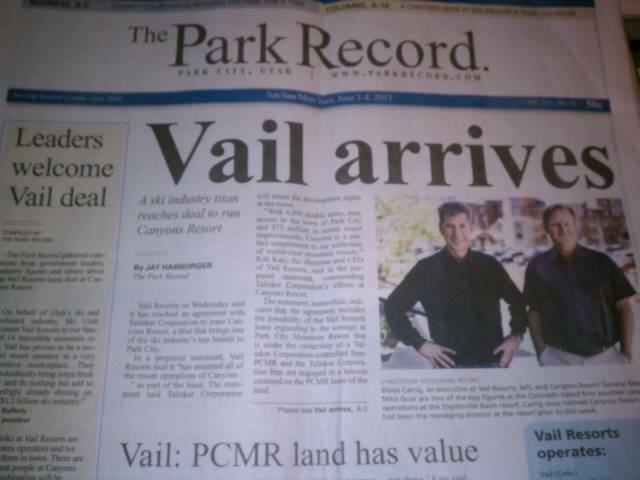 It appears that Vail will pay $25M annual + profit sharing to the Canyons owner, Talisker. It is a 50 year lease, with 6 renewal options! (Have you ever heard of a 350 year lease? I guess that's called a long term lease. Talisker retains base area real estate development rights of 4 million square feet of approvals, but Vail will be motivated and allowed to continue on mountain improvements! Here is link to the announcement in the Salt Lake Tribune I couldn't create a link to the Park Record article, but click here to go to the Park Record on line. As Tom Clyde points out in his column in Saturdays Record, at $100/lift ticket, that's 250,000 full price lift tickets that need to be sold to break even on lease payments, let alone mountain operating costs! To quote him... "...That seems impossible. Not even Vail can convince the faithful in Salt Lake to skip church and pay retail to take six kids skiing on Sunday! " Tom is a funny guy! However, rumor is that part of the plan may be to sneak up on PCMR and acquire operations there as well, as Vail acquires control of the PCMR land leases that Talisker owns. PCMR CEO John Cummings has got to be nervous. However, a future lift connection of Canyons to PCMR would only take two or three more lifts, and would be a great amenity, similar to the "AltaBird" connect between Alta and Snowbird. Deer Valley may feel pressure as well, however, with a unique and probably well protected niche in the market, (No Snowboards at Deer Valley for instance), the Vail presence in Park City may just inspire Deer Valley to even more great on-mountain improvements to keep up with its neighbors. And maybe keep DV's lift ticket prices from increasing so fast! Note that the "Vail Epic" season Pass good at 12 Resorts in North America and Europe, including, now, Canyons, has been $685! Deer Valley's season pass was $2100 last year! Go figure! Sure, the Burgers are better at Deer Valley, but I bet Vail will fix that) As apparent in most other editorials, I believe the Vail Park City presence to be big news to the positive for the Park City area image, economy, skiing (riding) and for all our area real estate values! What will Vail do on the mountain at Canyons? New lifts? New runs? How will this accelerate the Canyons Golf Course construction? What will Vail's approach be to the "SkiLink" idea to connect Canyons with Solitude? Will Vail eventually gain operation of PCMR and perhaps connect it with Canyons? Stay tuned for interesting stuff in the coming months! For Real Estate facts, values, opinions, and first class Buyer/Seller real estate service, don't hesitate to contact me!